Choose your domain & any Regular or Premium Web Hosting Plans. Use ‘Promo Codes’ while you checkout. 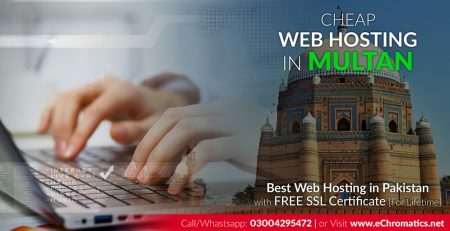 We provide Best and Cheap Web Hosting in Lahore Karachi Islamabad and all over Pakistan with Free SSL Certificate for lifetime with all of our web hosting plans and Free Domain Registration with Premium Hosting Plans in Pakistan. Subscribe now with us. We are at top among best Web Hosting Companies in Pakistan which offer affordable and economical web hosting package prices which are compatible with any budget and need of the customers. We are also your Web Design Company in Pakistan if you need to get your new website designed or simply want to get your old one re-designed. Either it is a Business website or eCommerce Shop with shopping cart and online payment system. Whether you are a web pro or just starting out with your first website, we are here to assist you with any aspect of your hosting experience. Our web application is accelerator powered by Varnish Cache which ensures the maximum performance of your website at all times. cPanel is a powerful control panel available on all plans which makes your hosting package management a great experience. Advanced email management features in cPanel allow you manage your email acoounts, mailing lists and more without any problem. Provided by Let’s Encrypt, a free automated and open certificate authority by the non-profit Internet Security Research Group (ISRG). Popular free scripts installer allows you to smoothly install a Blog, a Shopping Cart, Photo Gallery or any other module in just 1 click. Choose from these Regular or Budget Web Hosting Plans offered by Best Web Hosting in Pakistan. Or choose from these Premium Web Hosting Plans offered by Best Web Hosting in Lahore Pakistan. 'Shared Cloud Hosting', 'Managed WordPress Hosting', 'Linux KVM VPS Hosting' and 'Managed Dedicated Servers' offered by Best Web Hosting in Lahore Pakistan. Click on 'See All Plans' and see all hosting plans to choose upon your budget. Cheap Web Designing Plans offered by Best Web Design Company in Pakistan. They are perfect in providing web solutions. We are using many of their services i.e. web development, web hosting and digital marketing since many years. Excellent web hosting and development services, nice web and social media management, have used on many projects. Strongly recommended. Best web hosting services and customer support in Pakistan. We are using their services since more than a decade….. simply great!